It is the middle of December and the weather is perfect for being outside. I wanted to do something and also felt crafty. 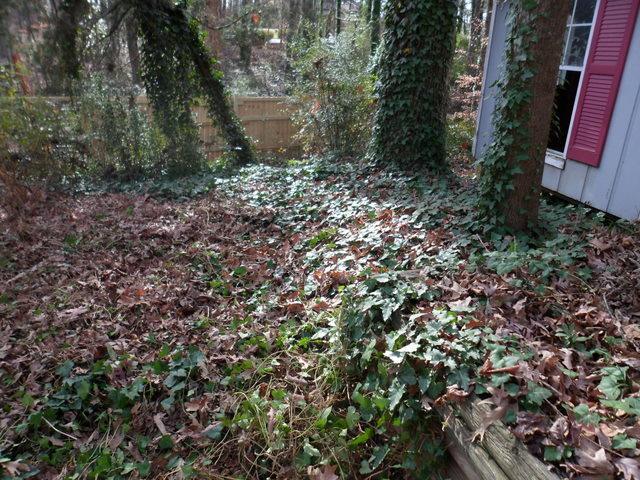 I made a long list of projects, but before most of them could be done I had to clear a bunch of ivy where we will be putting in a chicken run. So since all the ivy had to go anyway, I thought I should do something with it, and that is what prompted this project. 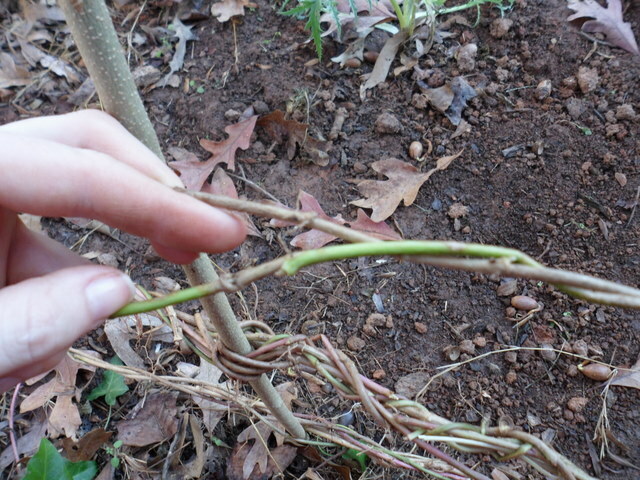 A wattle fence is made by weaving flexible branches or vines between posts, like making a giant basket. The posts can be very small like the ones I used for this, or much bigger. The weaving material needs to be small and pliable enough to work with. Saplings are great for this; many people use willow and it is supposed to be just about the best thing you can use. I don’t have any willow, but I would love to try it some time. When I buy land for my farm one of the first things I will plant is willow. This is an old practice. If you have a hatchet and enough material, you can build fences, walls, or even houses using these techniques. When building a house use wattle and daub. Daub is a mud type stuff put all over the wattle. You should look it up, they can be neat. Wattle can be pretty or rustic, and can last a long time. The first step is to cut down some branches. I chose to cut them each 4 feet long. 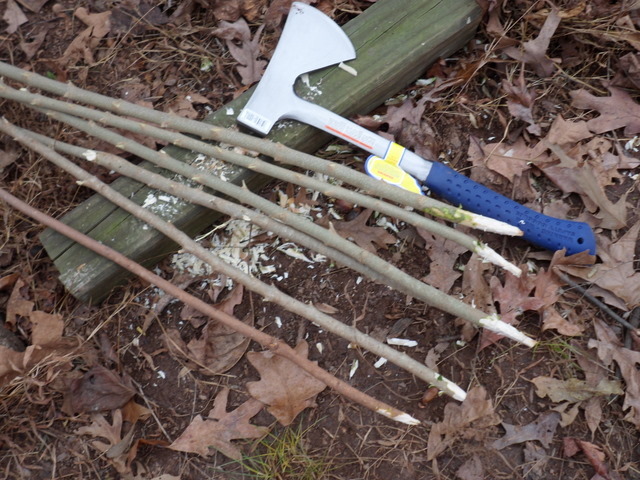 You can clean off all the smaller branches on each or leave them for the weaving; I chose to clean them because I find that easier. I left some forks and lots of little nodes to set the weaving on. Once I had as many as I thought I would need, I made the ends sharp with the hatchet. Hitting things with a hatchet is fun; if you have never done it before you should. After that I pushed them in to the ground and then hit them with a hatchet, so were really small at the top. At this point I realized they would have been better a little thicker; I worry about them falling over. But they are what I have, so I carried on. Once the posts were in the ground I started gathering the weaving material and weaving it on. This is the part that took a long time. Sometimes the ivy would break while being pulled out, as it was such a tangled mess. Some of this was here before we moved in, and we have not done much to keep it under control. I took off the leaves and roots of each piece to make them easier to work with. Some pieces were very long, as much as 8 or 9 feet, some that I used were as small as 3. It was pretty much random. If I liked a piece I used it. If not, I put it in the leaf pile. This part took several hours of work over the course of a few days. The hardest part is joining a new piece to an old piece; sometimes that can be really annoying, but before too long I had the hang of it. As you can imagine, it gets pretty complex. 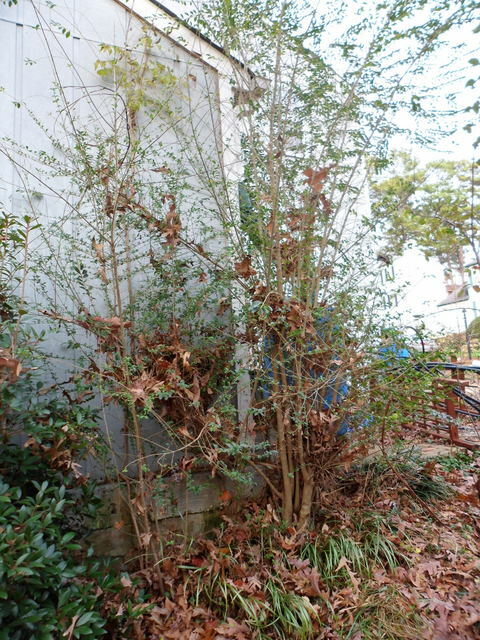 I went around the fence 3 times on each level, wrapping, braiding and weaving the ivy. This picture is of a first pass, but you can see the finished ones underneath. This is fun alone or with friends. It is much faster and easier when you have help, because often 3 or 4 hands are needed to make it work right. The structure is all done now, if a bit wobbly, and I am happy with the results. If you don’t like old fashioned or rustic, it might not be your thing, but if you like free then it certainly is. There is more I can do here if I want. I can weave the other direction, making it sort of chain link. Or I can go diagonally from post to post, making a diamond pattern. Or I can decorate it, which is what I am doing. So far I have added on some ivy with leaves, and I am going to put on bows and maybe some white holiday lights.